It would be nice if those 300 days of sunshine Wikipedia says certain parts of Central Washington get each year translated into 300 golfable days. Alas, the weather’s just too unpredictable from November to April to be scheduling rounds weeks or even days in advance with any confidence of getting pleasant conditions. So you do the sensible thing and head off to Arizona where you can be about 92% certain it’s going to be warm and bright, and probably not covered in the two inches of snow that Dove Mountain near Tucson was earlier this year during the first round of the WGC Matchplay tournament. You can be sure that whichever course you play is going to be firm and in the sort of condition you didn’t think possible this side of eternity. Just about anywhere in the bottom half of the Grand Canyon State usually works just fine but, of course, the most highly-prized destination; the desert mecca every golfer wants (and needs) to visit at least once in their life or, better still, twice a year every year until the day they die, is Scottsdale -, Phoenix’s poshest suburb where take-out sandwiches are made with artisan focaccia bread rather than Mighty White, and communities are often gated. The north end of town is where you find the very best courses, with one patch in particular boasting way more than its share of enviable golf. You almost feel like you could throw a blanket (a very large one admittedly) over the world-class layouts around Dynamite Blvd, Jomax Rd, and Alma School Rd, an area well-known to discerning golfers especially the thousands of Chicagoans, Seattleites, Minneapolitans, Vancouverites, and Calgarians that call Scottsdale home during the winter. There’s Troon North – Monument and Pinnacle, Troon Country Club, Estancia, Desert Highlands and the Golf Club of Scottsdale. If you can afford or are able to arrange a game at any of these very expensive and, in most cases, very private courses, then good for you. But don’t worry if you can’t, because a few miles further east on Dynamite which becomes Rio Verde Drive, you come across a very, very good course which anyone is welcome to play. Vista Verde was developed by members of the Mooty Family, partners in a prominent Minneapolis law firm, who are also developing the Tonto Verde and Rio Verde retirement communities on the edge of the Tonto National Forest and in view of the Mazatzal Mountains. 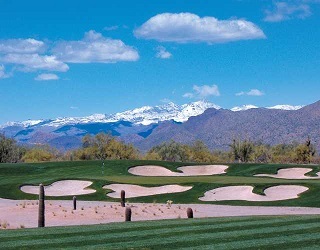 Vista Verde GC opened in 2006 and was designed by Tucson-based Ken Kavanaugh. Maybe not, but it’s not scarred by waterfalls, fountains, and other over-the-top water features either. What it is though, is a course that fits the ideal of challenging good golfers while allowing less capable players to have a good day out with their buddies. There’s no clubhouse yet, and you pay your green fee at the entrance gate about half a mile from the 1st tee. That’s not ideal perhaps, but I’m guessing you won’t mind a bit after playing the course. Even though it’s been around for seven years, little is known of Vista Verde which inevitably lives in the formidable shadow of its near neighbors. But now you know, and now you can score some points at home telling your friends about this great ‘new’ course you’ve found. You’re welcome.